I’ve been thinking a lot this week about the foods that I cook and the ingredients I work with. Eric and I will be hosting exchange students starting next week, and one of the biggest complaints exchange students seem to have is with the food provided by the host family. Fortunately the problem is usually that there aren’t enough vegetables, not going to be a problem in our home. Still, I’ve gotten so comfortable cooking for Eric. I know his favorite ingredients, and what to do with his not so favorite ingredients. I know how he likes his coffee or tea, and that an apple with a side of peanut butter is sure to bring a smile to his face. I﻿ use﻿d to think about cooking for our future children﻿﻿; how I would teach them about different ingredients, take them to the farm where we get our eggs and meat, have them help me in the garden. Now I’m thinking about cooking on a regular basis for two young adults who already have developed tastes and preferences. Will they think of me as the crazy lady who puts eggs and bacon on salads? Or will everything be so new to them that it all just seems exciting and interesting? A few years ago these kinds of questions would have kept me up at night. I would lay in bed going through every dish I’ve ever made, trying to decide which were the most culturally friendly and easy to make. Wondering if we’ll find out what country they’re from in time for me to learn at least ten basic staple dishes of their respective cuisines. Fortunately I’ve gotten quite skilled lately at deciding I’m just not going to be nervous. Speaking to a group of women about my “sordid” past and the extreme moments that made me who I am today? Don’t think about it, just tell your story. Having crazy almost passing out moments when my heart seems to be racing or missing a beat? Don’t stress, just go to the doctor. Friend making the worst decision of their life and you’re the only one willing to lovingly tell them so? Don’t try and think of every possible reaction they might have and how you should respond to each one, just be a good friend. Ah, thankful for lessons learned in the big things, I can now tell myself not to stress about the little things. I’ll just take life as it comes! 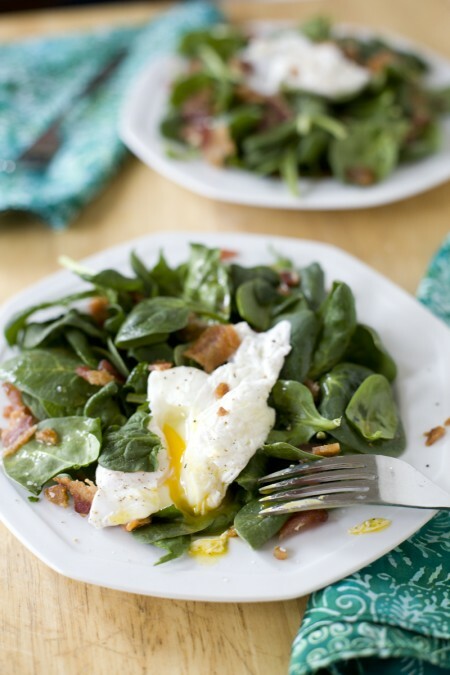 One crazy breakfast salad at a time! By the way, tomorrow is St. Patrick’s Day. Unless you have kids, I’d suggest staying away from the green eggs and ham. They’re just not that appetizing for adults. 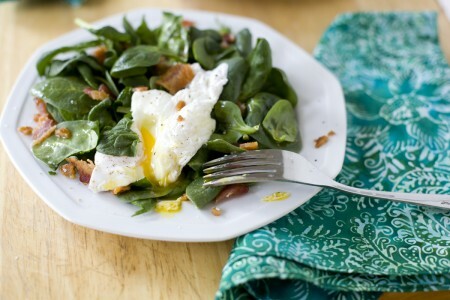 But if you’re still wanting to go the eggs and pig route, this bright green salad is a great alternative. 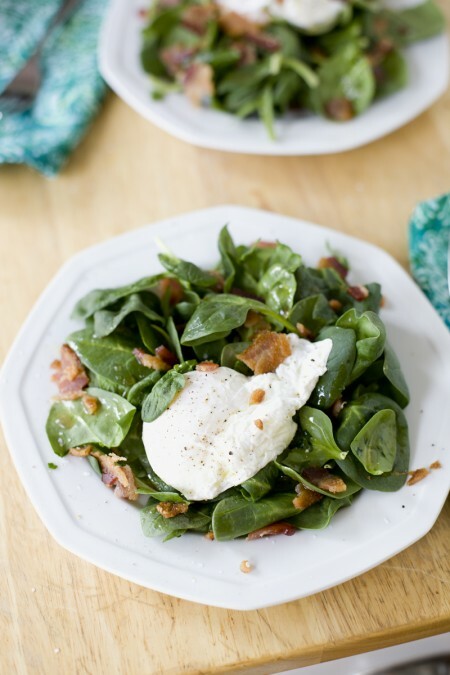 Use Irish bacon (or rashers) for a fun St. Patty’s twist. Or if you’re looking for something more authentic, my Irish Beef Stew recipe can’t be beat. Divide spinach between two plates. Crumble bacon over the spinach. 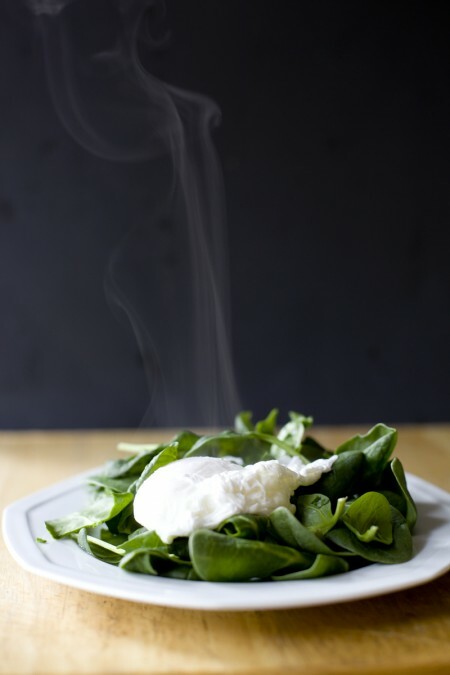 Place a hot poached egg on each salad. Whisk together red wine vinegar, oil and sugar. Drizzle dressing over salads and top with kosher salt and fresh ground pepper. Break open the egg and let the yolk seep out over the salad to serve. Approximate cost/serving: This cost just $1.20 for two salads so 60 cents a serving. Gluten Free: No adjustments needed. Great idea! These are the ingredients (minus the dressing) that I usually use for scrambled eggs so this will be a great way to freshen up that dish! I hear you B, I rarely make an omelet without spinach and bacon. They both go so well with eggs! I really really love this salad. it look so good. The exchange students would be crazy to not like your food. Yum. 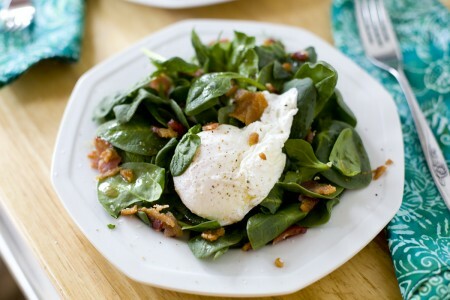 I’ve never thought of this as a breakfast salad, but I do enjoy a good poached egg and bacon over a spinach salad. I definitely don’t have that nearly enough. I would be nervous about cooking for exchange students as well, but you’re probably right in that no value can come of being nervous BUT it could be a whole fun new experience of learning dishes from their country. That said, I think a lot of times the kinds of kids who become exchange students are also very interested in the kinds of foods their host family eats. I remember traveling abroad to France, Australia, and New Zealand at various points in my teenage years. All were student trips so I stayed with families and it was very fun to try their foods as well. Thanks Kelly, that’s really encouraging. I love Korean food, we know one of our students is from Korea, so will have fun cooking their native foods for them sometimes. I’m so into salad with poached egg. Or cooked kale. LOVE it. I have a ton of spinach that I need to use. I think this might be the way. I love a good, runny egg!!! oh gosh. ooooooh dear. ohhhhhhh dear. this looks too good. I am rethinking my brunch for tomorrow.